Made with organically grown farm fresh cucumbers, this gel is another of nature's wonder as a powerful aid in treating several skin problems. Benefits: Cucumber is a natural sourse for erepsin and proteolytic enzymes, vitamin B1 and Vitamin C, all of which are wonderful in treating skin eruptions, eczematic freckles, pimples, black heads, wrinkles, dryness of face etc. The gel is also used as an important ingredient in several beauty products, skin tonics, face packs etc. Other uses: Cucumber gel has alomost all the benefits of aloe vera gel except that aloe vera is better for hair than cucumber. 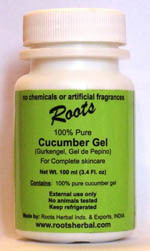 Additionally, cucumber gel is used for following important treatments. For sun-stroke: Apply a generous amount of gel on the areas affected by sun-stroke, leave it for 25 minutes and wash with cold water. Cucumber gel is extremely soothing and imparts cooling effect on skin. Puffy and tired eyes: Take one teaspoon of Cucumber gel and add three spoons of ice cold water and mix. If available add a few drops of rose oil, or lemon oil (or both). Take a couple of cotton pads and soak them in the mixture. Relax in a chair with head up and put the pads on the eyes until eyes feel relaxed and less tired. When the pads become warm, soak them again and repeat the process. Additionally, our cucumber gel is provided with most of our products like dark circles, pimples, acne etc and is a vital ingredient in the preparation of the herbal paste for all our products.